Bio: Barbara Reich was born and raised in Michigan. She began to study drawing and painting in 1990, and since 2001 she has been painting full time. She is a founding member of Mid-Michigan Plein Air Painters. 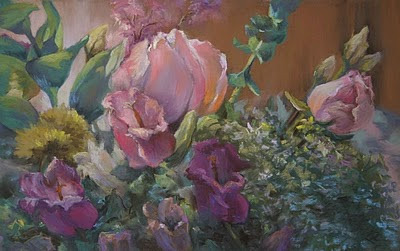 Barbara exhibits in local, regional, and national exhibitions, and she was chosen by the Great Lakes Pastel Society to be a Featured Artist in 2006. Barbara is included in The Best of Michigan Artists and Artisans book series she had two paintings included in The Best of America Pastel Artists, Volume II, and is also included in the Detroit Society of Women Painters and Sculptors Member Folio Book. She was awarded "Outstanding Pastel" in the National Bold Brush Painting Competition in 2009, and received numerous national awards in 2010. Medium: Pastel. Oil, Watercolor, and Charcoal. Barbara's painting time is divided between studio painting, figurative work, and plein air. Navigation: A FineArtStudioOnline website, with it’s usual navigation style. Gallery: Landscape/Plein Air/Floral; Animals/People; Most Recently Added Paintings; Hanni Gallery. Image View: Each gallery consists of a page of thumbnails. Click to enlarge, and click again to enlarge further, and download if you wish. Information is provided by resting the cursor on the thumbnails, and on the enlarged images. Special Bouquet is 10 x 16 ins. 550 x 345, 181 KB.